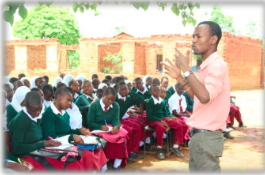 NEW YORK, N.Y., April 16, 2015 — MCW, a New York-based non-profit organization dedicated to empowering youth to become positive agents of change in their communities, has awarded Abdu Mwimi of Tanzania an Alumni Ventures Fund (AVF) grant. Abdu will receive a grant up to $4,000 and a year of mentorship to turn his idea for change in his community into a concrete project, drawing on his experience of drafting a “vision plan” for social change at MCW’s annual Youth Leadership Retreat program. Since establishing the Alumni Ventures Fund in 2009, MCW has awarded five grants to graduates of the MCW Youth Leadership Retreat. Preparations are now underway for MCW’s 18th Leadership Retreat, to be held from July 29 to August 5, 2015 at Stony Brook University in Long Island, New York. Applications can be found on the website at www.mcwglobal.org. MCW is a non-profit organization founded in 1999 with the vision “Local Change through Global Exchange®.” Our mission is to empower youth to become positive agents of change in their communities. Based in New York, with partner organizations in Africa (i.e., Rwanda, Sierra Leone, Tanzania and Zambia), MCW offers the following programs: Global Youth Development, Community Development and Oral Health Care, as well as Partner Initiatives (e.g. Paediatric AIDS Treatment for Africa). MCW’s core values include integrity, compassion, accountability, responsibility and excellence. www.mcwglobal.org.